Efficient Building Controls | Controlled Air Inc.
Building controls systems are one way to save money and energy on your building. If your system is not set up correctly you could lose energy and money. There are many reasons you system may not function optimally and we will discuss a few of them here. It is important to make sure that staff does not manually override any of the settingsand that they are trained in reading any errors within the system so that they can react properly. Another very important part of building controls is evaluation. Once a system is set-up it should be monitored to determine if the building is operating as efficiently as expected. Building controls systems are not a “set it and forget it” system. You may have expectations that a building will need a certain amount of heating or cooling, but it may actually need more or less. The building controls system, as well as the equipment connected to it, need proper maintenance. Like all things mechanical,building controls systems require maintenance so that they perform at top efficiency. Maintenance includes calibrating sensors, checking valve actuators, damper actuators and backup information. It is important to make sure all equipment and systems are updated and have the proper service and maintenance. All equipment should be connected to the building controls system. If not, improperly functioning equipment may go unnoticed. This could lead to a decrease in the equipment’s efficiency or a breakdown of the equipment. The building controls system helps to identify smaller issues occurring in the equipment thereby decreasing larger ones. Having more items visible to the building controls system, such as lighting and HVAC has many benefits. Lighting levels within a building can make a very large impact on the energy use and the air conditioning load. We often install Facility Explorer supervisory controllers that provide integrated control, supervision and network management services to one or more local networks of field controllers. These controllers also provide system-wide coordination to automate building control operations. All Facility Explorer supervisory controllers provide modular and scalable supervision and control for your building automation system. You choose only those hardware and software features that are applicable to your project requirements. 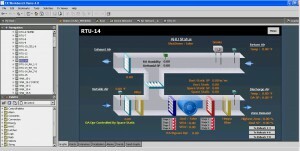 One feature includes the ability to visually see how systems are functioning. Make sure you are getting the most out of your building management system by using it to its fullest capabilities. The small investment in training, monitoring and maintenance will provide a true cost savings to your company.